Kieran J. Hanlon is Assistant Professor of Double Bass and Jazz at The State University of New York at Fredonia. In addition to his teaching, Kieran is a first call performer in both the classical and jazz idioms, and enjoys a diverse performing career in both genres (among others) across Upstate New York and Pennsylvania. Kieran performs on both acoustic and electric basses. 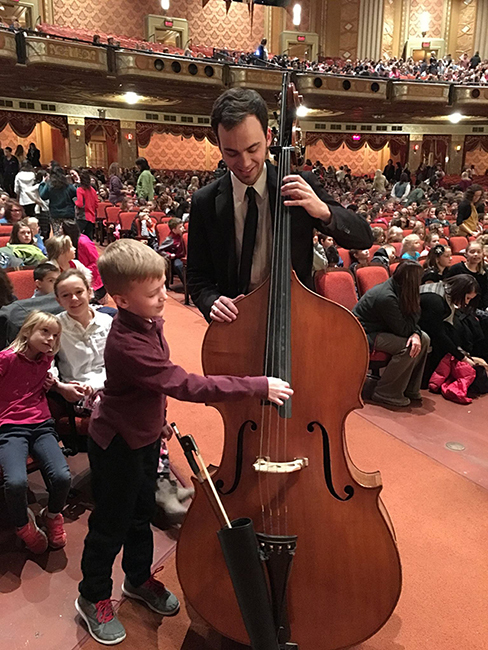 An active orchestral performer, Kieran is Principal Bass of the Erie Philharmonic, and works as a substitute double bassist with the Detroit Symphony, Chautauqua Symphony, Buffalo Philharmonic, and the Rochester Philharmonic. He has toured to Carnegie Hall with the Buffalo Philharmonic, and recorded Reinhold Gliere’s Symphony No. 3 “Il’ya Muromets” with the orchestra for the Naxos label. In addition to frequent engagements as a freelance classical musician in upstate New York, Kieran is a first call jazz performer in the area, and is the bassist for the Buffalo Philharmonic Big Band. Additional freelance playing includes work with jazz greats such as Sal Andolina, Bobby Militello, John Bacon, Dave Mancini, George Caldwell, Lisa Hasselback, Alec Dube, John Nyerges, Andy Calabrese, Chris Azzara, Bob Sneider, Rich Thompson, Chet Catallo, Les Sabina, Dave Schiavone, Mike Jones, Bobby Jones, Dan Hull, Bobby Lavell, and Bill Tiberio. He also works with Celtic artist Cathie Ryan in performances of traditional Irish music with professional symphony orchestras. On campus at Fredonia, Kieran is committed to bringing in and performing with high-profile guest artists. Featured visiting bassists include James VanDemark, Brett Shurtliffe, Daniel Pendley, Jeffrey Turner, Rufus Reid, Marco Panascia, Nick Walker, Diana Gannett and Blake Hinson. Of particular note in the jazz idiom were Saturday Night Live drummer Shawn Pelton, former Chuck Mangione guitarist and Eastman Professor Bob Sneider, former Jay Leno band guitarist and major LA recording artist Tom Rizzo, Dave Brubeck Quartet saxophonist Bobby Militello, and well-known Cleveland based saxophonist and educator Ernie Krivda. Kieran plays a 2005 Michael Griffin Orchestral Model acoustic bass for classical music, a 2002 Christopher 5-string for jazz, and Yamaha electric basses. Kieran is a D’Addario Orchestral Artist. An active arranger, Kieran has written and continues to write custom works for Fredonia faculty ensembles, focusing on increasing the scope of repertoire the faculty performs by incorporating jazz, pop and improvised music. 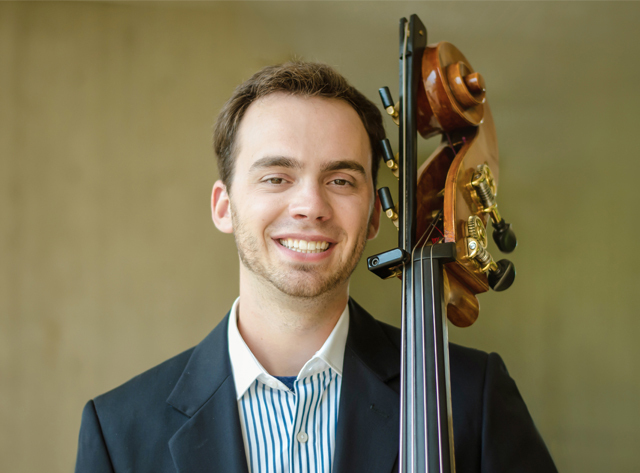 In May 2014, Kieran completed a Master of Music Degree in Double Bass Performance at the Eastman School of Music with Professor of Double Bass James VanDemark. He also completed Eastman’s Orchestral Studies Program, in which he worked as a playing intern for two seasons with the Rochester Philharmonic Orchestra. Kieran’s undergraduate studies were completed at The University of Michigan School of Music, Theatre and Dance in April of 2012, where he studied classical repertoire with Professors Diana Gannett and Stephen Molina and jazz with Professor Robert Hurst. He holds a B.M. in Double Bass Performance and a B.F.A. in Jazz Studies, Bass from Michigan. He also won third place in the Orchestral Competition at the International Society of Bassists 2013 Convention in Rochester, NY. Kieran has performed by invitation with the Canandaigua Lake Chamber Music Festival, the Lake George Music Festival, and the Gateways Music Festival. He also spent the summer of 2011 as a Rotating Principal Bassist with the National Repertory Orchestra in Breckenridge, CO. As a chamber musician, Kieran performed and recorded extensively with the chamber choir Madrigalia in Rochester, NY on cross-genre compositions and arrangements for choir and chamber ensemble by composers John Rutter and Cary Ratcliff among others. Outside of the music world, Kieran enjoys working on his house and Jeeps, biking, hiking, spending time near Lake Erie, and quality time in fellowship with good friends and colleagues.